NEW YORK, Oct. 10, 2017 /PRNewswire/ -- Michael Jackson SCREAM, a collection of 13 of his all-time most electrifying and danceable tracks including Thriller, Dangerous, Blood On The Dance, Floor, Ghosts, Torture, and Dirty Diana, debuted on the album charts at #3 on Current and Overall Pop and #3 on Current and Overall R&B and #8 and #10 for Physical and Overall Album sales, respectively. It also debuted in the top 10 landing at #9 in the UK. SCREAM is the essential playlist for the Michael Jackson takeover of Halloween, which also includes Michael Jackson's Halloween, an animated special which premiered at Comic Con last week, and will have its official premiere on October 27 on CBS. 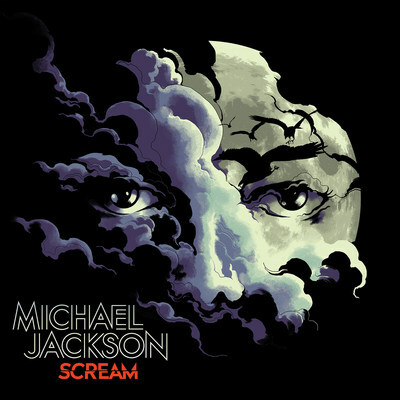 The choice of tracks for SCREAM reflects The King of Pop's affection for this time of the year and its themes of costumes and disguise, darkness and light, character transformations and surprise. It's the perfect soundtrack for Halloween/October parties. Consequence of Sound wrote, SCREAM is "a collection that usefully corrals the man's darkest and spookiest fare into a convincing and sonically fluid totality of its own." The album will also be available on October 27 in glow-in-dark vinyl. CDs and vinyl each containing a poster unique to the format. Fittingly, the poster and cover art conceal the first-ever AR (augmented reality) experience created for a Michael Jackson project. Each track on SCREAM is remarkable in its own way. For example, "Thriller", penned by Rod Temperton, was the seventh of an unprecedented seven Top 10 singles from Thriller, the biggest-selling album of all time; "Dirty Diana," was the fifth consecutive No. 1 song from the album Bad which shattered records for consecutive chart topping singles off a single album; and the Top 5 hit "Scream" is the only duet between Michael Jackson and his sister Janet. Also included are fan favorites from The Jacksons' albums - "Torture" and "This Place Hotel" (the first single to be written, composed, and arranged solely by Michael); and, making its first appearance on a Michael Jackson album, "Somebody's Watching Me," the international 1985 hit by Rockwell featuring an iconic hook sung by Michael. SCREAM is available on iTunes now: https://MichaelJackson.lnk.to/SCREAM_itunes. SCREAM is also available on AMAZON: https://MichaelJackson.lnk.to/SCREAM_amazon and on collectible, glow-in-the-dark 2LP vinyl (which will be released on October 27): https://MichaelJackson.lnk.to/SCREAM_VINYL. Fans are invited to Official Michael Jackson SCREAM Album Celebrations this fall. The first of these celebrations took place in London and Sydney. Paris and Berlin are hosting events this week and the celebrations in Los Angeles and Tokyo will be later this month. The events will feature the full-length 40-minute Michael Jackson's Ghosts, rarely seen following its initial screening at the 1997 Cannes Film Festival and "Michael Jackson's Thriller" in 3D. An after-party will follow each celebration.